Our facility in Granger is our newest location, having opened in November of 2005. Many within the industry have said that this is the largest, most elegant funeral home in Indiana. Its high-end custom design features include: a full service kitchen and lounge decorated in an Italian Tuscan theme, a children’s room with an X-Box and children’s books, and fire places. 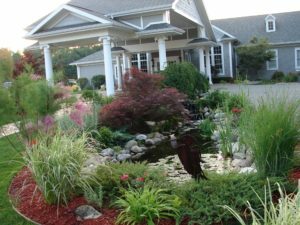 Outside, visitors are welcomed by beautifully landscaped gardens, ponds, and waterfalls. Inside, our dynamic chapels can accommodate everything from small family gatherings to large funerals and events with hundreds of guests. This location is often admired for it’s beautiful landscaping by passers-by, who notice the massive rushing waterfall as they drive by. Our 10,000-crystal chandelier, which can be seen glimmering in the window at night, has become a “lighthouse” landmark in Granger. “Wow!” is an oft-heard expression upon entering through the front doors into the grand entrance hall. It is immediately apparent that this is not what they expected a funeral home to look like! 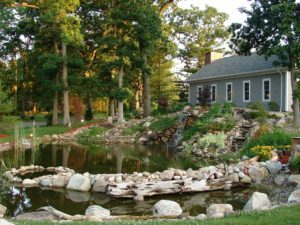 The vision of this facility was to provide a home-like atmosphere with couches, a fireplace, and tranquil gardens, tree groves, and streams. The outdoor sanctuary allows for a space where guests may stroll, gather, and rest in peaceful contemplation. These three dynamic rooms can be configured to be sized perfectly to honor a small family gathering, or all three rooms can be opened up to accommodate the large funeral services dictated by the passing of a young person or public figure (1,000-person capacity). 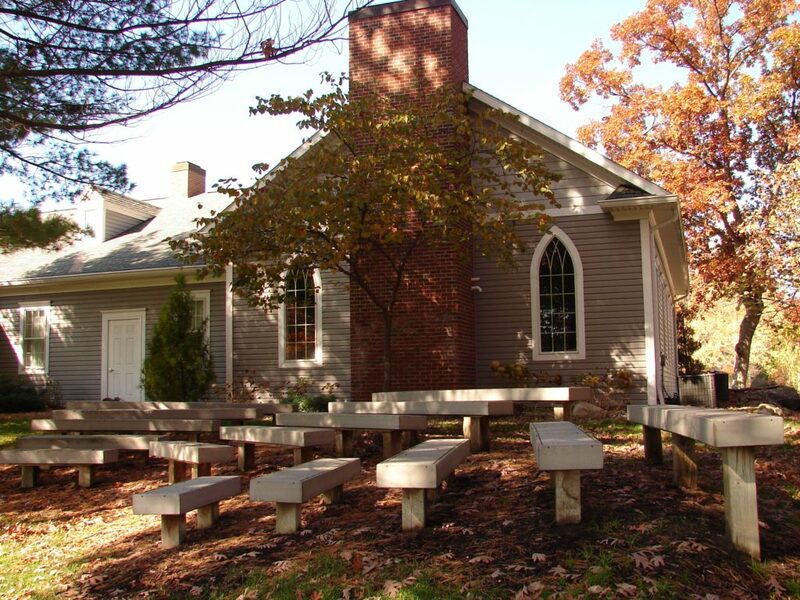 We have hosted other gatherings such as weddings, high school reunions, as well as the humble beginnings of a few local churches who rented out this facility on Saturdays until their congregations grew large enough to purchase their own space. Positioned in a separate area from the chapels, but adjacent to the Foyer, our Lounge/Community Gathering Room will make you feel like you are truly at home, rather than in a commercial building. The Lounge-Kitchen area features an open floor plan that will accommodate a buffet table, comfortable chairs, and small café tables & chairs where guests may talk, and tell stories, or take a moment to step away from the main service. A working fireplace and fluttering butterfly collection add to the warmth of this room, and is viewable on both sides of the wall that separates the Lounge from the Foyer. 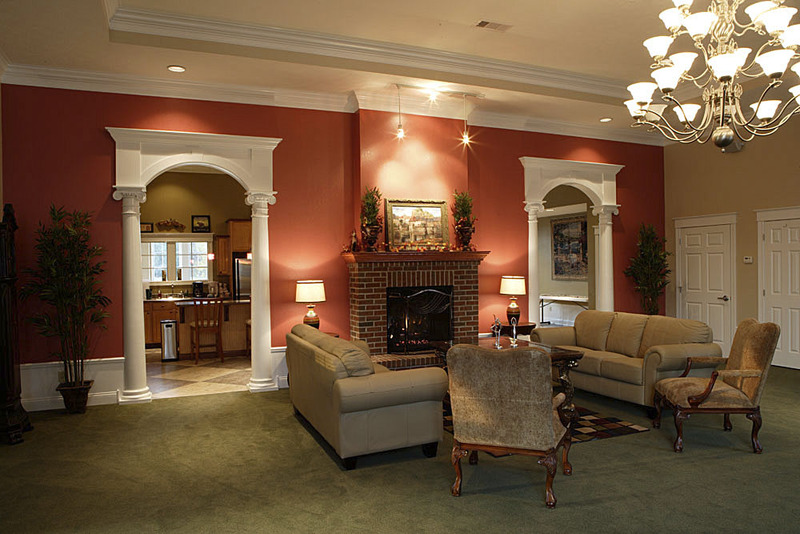 The Foyer features couches and comfortable lounge chairs for overflow and further relaxation. Our full-service kitchen allows your family and friends the option to gather before the service, or stay after and chat over food, eliminating the need to quickly clean your home or coordinate last minute restaurant arrangements. We are able to cater a full meal after a funeral or memorial service, or provide a trays of vegetables and dip, fruit, cheese and crackers, desserts, or sandwich to put out during visitations. 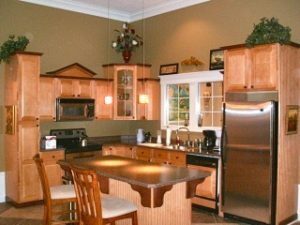 Stainless steel appliances, light maple cabinets with dark crown molding, and an island with stools and beautiful counter tops will make you and your guests feel right at home. 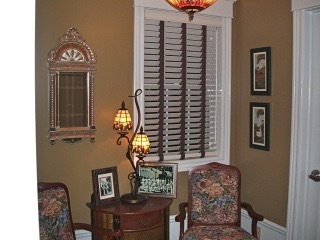 As in most homes, this is a great place to chat and enjoy a snack or drink. 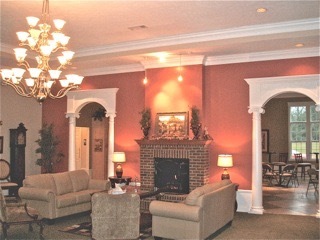 We always have free soda, water, premium regular and decaf coffee, hot chocolate, and hot tea at all our funeral homes. Off the Lounge/Kitchen area are comfortable bathrooms with interior full-door stalls on the interiors to allow for maximized privacy for those who need somewhere to “gather themselves” for a bit. We designed the Ladies’ room with added comfort measures in mind, including unique faux painted walls and a special “mother’s area” that is completely separate from the toilet area and features a rocking chair, a table for feeding supplies, and an outlet for pumps or cellphone charging. Please note that, although this area is provided for additional comfort, we welcome all babies — breastfeeding or not! — in any area of our facilities. You will never be asked to “cover up” or move to a different area. We feel it’s important for children, during times of grief, to have a sanctuary where they can step away and process what is happening around them. This gives them a sense of ownership of their grief, as well as space for adults to have peace when they need it as well. The Children’s Room was created with just this in mind. 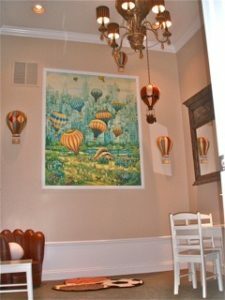 It features a light and whimsical Hot Air Balloon theme with a child-sized table and fluffy pillows, as well as a library of children’s books — including selections on grief and loss just for children, specially researched for this room by Pat’s daughter, who specializes in child development. An X-Box provides a more “high-tech” escape for children who need it. Located adjacent to the Lounge, this space features a large window to facilitate parental supervision while minimizing noise and facilitating a tranquil atmosphere. Riding the crest of the wave, we built this facility with the idea of other non-funeral uses also in mind. Our Granger Chapel is one of the first in the country and the first in this area to be built as a multipurpose facility. A new trend nationwide is for funeral homes to make better use of their facilities during “downtimes” when funerals are not in progress. For larger events, this is primarily Saturday evenings and Sunday mornings. Smaller groups can be accommodated at other times and days — often without charge. To date, we have hosted weddings and meetings of up to 350 people, receptions and dinners up to 250 with a dance floor, or 275 without a dance floor. 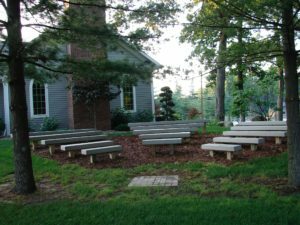 Our idyllic Outdoor Chapel is wonderful for weddings, has seating for about 85 people, with “back up” right inside if it rains. 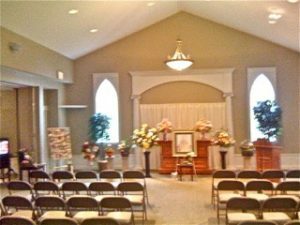 It may seem strange, at first, to hold a wedding at the same place where funerals are held. However, it doesn’t seem so strange when one considers the fact that both weddings and funerals are also held at the churches, mosques, and temples we frequent every week. But more than that, once our guests see how beautiful and home-like our facility is they will wonder why they ever questioned it. We invite you to stop by and experience this truly unique and beautiful facility. We welcome drop-ins, but even if no one is at the facilities when you stop by, we invite you to walk the property, sit in quiet contemplation in our Outdoor Chapel, and peek in the windows! Click here for detailed directions to this location, or give us a call to schedule a tour at 574-232-1411.